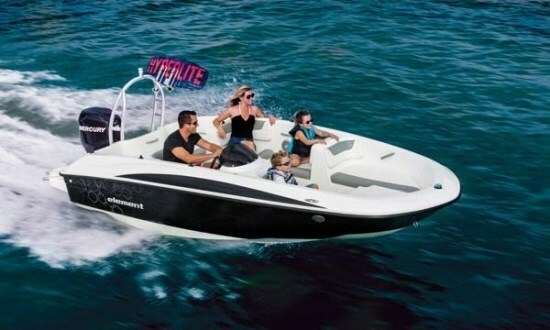 “Affordable boating has been redefined,” says Bayliner in describing its brand new 16-foot bowrider which was officially unveiled at the New York and Toronto boat shows in January this year. Keep it simple. Make it practical. Make it affordable. These would appear to be Bayliner’s objectives with the Element and they most certainly seem to have achieved all of the above in spades. The Element is easy to own, easy to tow, easy to store. 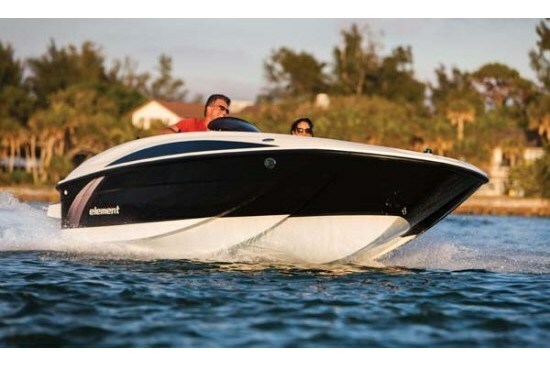 Or as Bayliner says, “Whatever held you back before is no longer in the way.” The first time new boat buyer would certainly seem to be the focus with the Element. 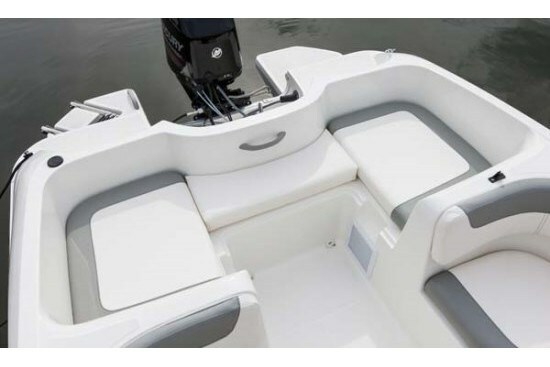 The interior is one molded inner liner containing the seat bases, helm side console, and bulkheads which themselves seem to create three separate sections within the boat. The centre section contains the side helm plus three quarter-round single seats allowing a person to sit facing in two different directions with equal ease and comfort. One of these seats is for the driver – the other two facing seats for portside passengers. The forward bowrider section has the normal side and forward cushions. A bow filler cushion to create a full forward sunpad and a portable 20-gallon Igloo® cooler are optionally available for this area. The aft interior section is a four cushion, full width rectangular sunpad area which could of course double for a seating area as well. Storage areas are found below all of the seats. 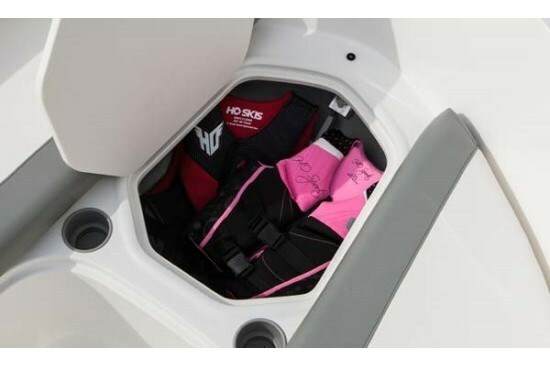 Under one of the aft sunpad seats resides the portable gas tank to feed the standard and only available outboard motor – a 60 HP Mercury Four Stroke BigFoot. Behind the aft sunpad is the outboard motor well and two integral swim steps, the starboard side of which has a folding boarding ladder. 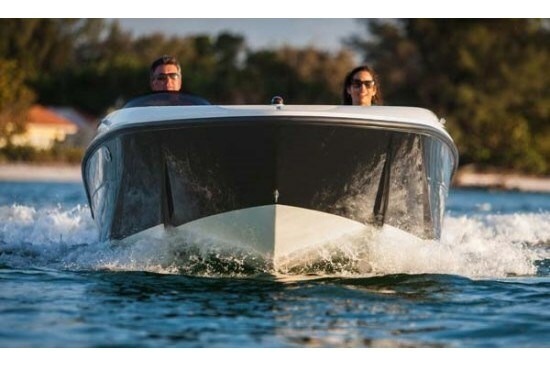 There is no windshield on the Element, but instead a plexi windscreen mounted atop the driver’s helm console to deflect wind and weather, similar to those found on most side console boats, and affording a full 360° unobstructed view for the driver. The console itself is one of simplicity and functionality with a single, large, centre-mounted 7-inch dual-function gauge, a cupholder, and the necessary few DC switches all in front of a padded steering wheel. 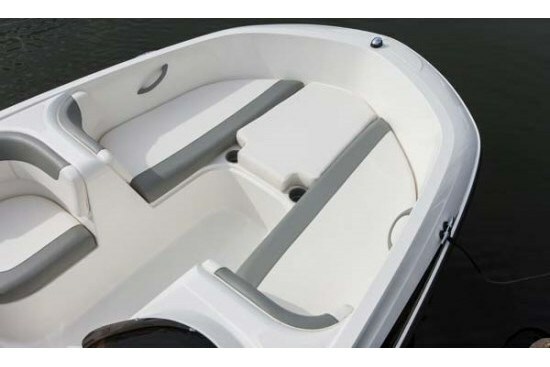 A total of five cupholders are conveniently placed within the boat as are safety handholds. 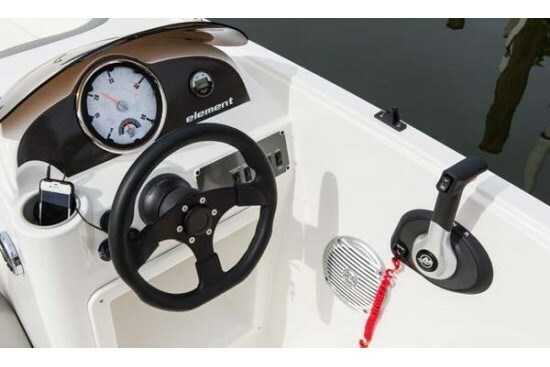 The Mercury side-mount engine control contains in-handle trim and tilt functions. A digital depth finder may be optionally added. The standard hull colour is Arctic white with a black hull stripe. A single-axle, galvanized, self-guiding trailer comes standard with the Element. Aside from those few mentioned above, the option list for the Element is quite short by intent. You may choose to add a waterproof 120-watt, satellite-ready, AM/FM/stereo with iPod and MP3 ports plus a Sunbrella® bimini top with boot and/or a mooring cover. 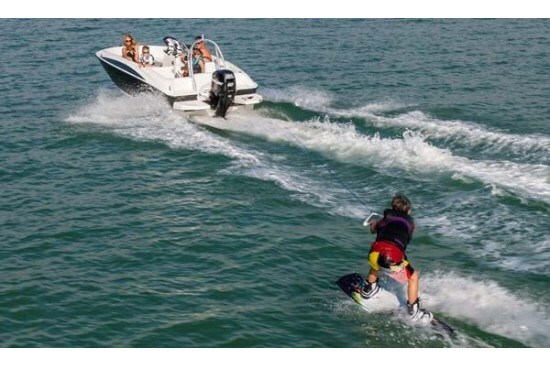 The biggest single option for the watersports fan is the Sports Package which includes a custom watersports arch with board rack plus your choice of black or red hull colour along with special graphics.